So what, exactly, is an inflatable fishing kayak? After all, you can fish out of any kayak, right? Heck, you can fish out of anything that floats. If you’re’ like me, you’ve probably fished from many strange things that just “happen to float.” I’ve fished from my a leaky Sevylor inflatable kayak, a round floating tube that resembled a floating donut and a floating recliner. But, admittedly, my attempts at fishing from a floating recliner were less than productive. Outright abysmal, truthfully. Of course, fishing wasn’t the primary reason I happened to find myself in a floating recliner. And this leads us back to inflatable kayaks. Inflatable kayaks, as a general class of boats, are excellent boats for fishing. The sheer versatility of inflatable kayaks makes them superb fishing platforms. They can be used on small ponds, large lakes, in sheltered ocean bays and on the longest and nastiest of river floats. Yet, not all inflatable kayaks are created equal. Or work equally well for fishing. So that’s why I created this article. To help anglers in search of a kayak find the right boat that meets their needs. Why Would You Want An Inflatable Kayak Designed for Fishing? One final note. I apologize for the length of this article. But I decided it was easier for anglers who are shopping for an inflatable fishing kayak to see all this information on one page, instead of spread out across multiple pages. There are, broadly speaking, four classes of inflatable kayaks: recreational, expedition, whitewater and dedicated flatwater. Recreational inflatable kayaks are meant for day uses. Examples include playing around on the lake or river, doing some fishing, diving and snorkeling. Good quality kayaks are also suitable for shorter overnight trips. Whitewater inflatable kayaks are meant, as the name suggests, for playing around in powerful whitewater. This type of whitewater, rated as Class IV or Class V, is a place few anglers visit by boat. Expedition inflatable kayaks are the workhorse of the inflatable world. Primarily meant for extended float trips through remote terrain and fully capable to tackle powerful whitewater, these kayaks are equally at home when floating the local river or paddling on the nearby lake. Lake paddling kayaks are meant for long paddles across large bodies of flat water. To put this in trip terms, think of paddling through the Boundary Waters Canoe Area. For such a long paddle, a kayak specifically designed to make lake paddling faster and easier is what you’d want. So what’s the big difference between these classes of kayaks and an inflatable fishing kayak? And if you’re an angler, why would you want one? An inflatable fishing kayak always comes from one of these three classes of inflatable kayaks (recreational, expedition, lake paddling). The difference is that these kayaks are designed with many “fishing friendly” features. An inflatable fishing kayak is a boat dedicated to fishing. Fishing is its primary use. While these “fishing friendly” kayaks do many other things well, these boats are first—and foremost—designed for fishing. Anglers who spin fish or fly fish will appreciate the “extras” these kayaks provide when compared to other kayak designs. These kayaks, when compared to other inflatable kayaks of the same class, make fishing more comfortable, fun and productive. 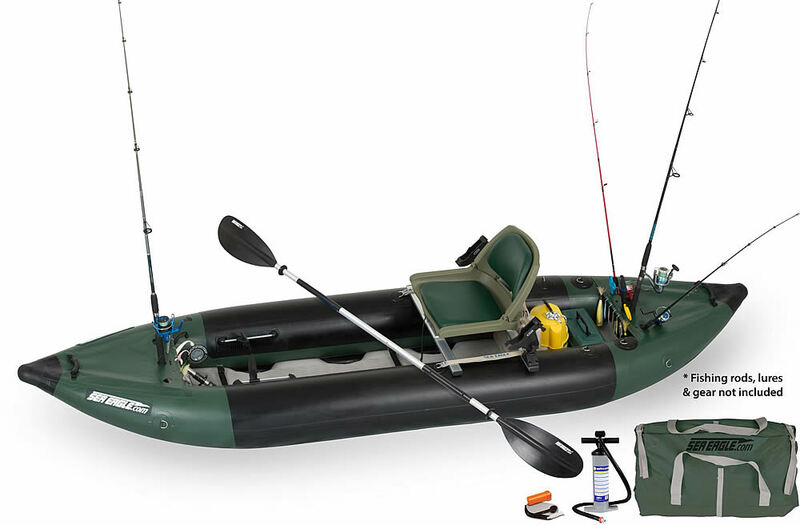 An inflatable kayak is a kayak designed for fishing that contains numerous “fishing friendly” features. How much of a “fishing rig” a person wants in their kayak entirely depends on their personal needs. The occasional fisherman will survive just fine without many of the features that more hard-core anglers desire. Occasional fisherman, in fact, just might be better suited buying a “non-dedicated” fishing kayak. Meanwhile, anglers who fish almost daily will almost certainly want a dedicated inflatable fishing kayak for the many benefits these boats provide. So what are some of the features often found on inflatable fishing kayaks that are lacking on other kayaks? Here’s a partial list. Using skegs or keels (or both) to keep the kayak tracking straight when it is paddled. This avoids yaw. Due to the huge numbers of inflatable kayaks available, I thought it would be helpful for anglers if I created an article that provided a list of some of the best inflatable fishing kayaks available. This list is by no means exhaustive. Undoubtedly, there are some kayaks I’m simply not familiar with or have never seen. And thus they aren’t included in this article. That said, all kayaks shown on this page are specifically designed for fishing. Each boat has its own strengths, and weaknesses. Finally, I made the specific decision to not list cheap inflatable kayaks (or basically kayaks that cost less than $200 or so). It’s been my own experience that inflatable kayaks that are “cheap” are cheap for a very good reason. These boats rarely last more than a season or two. And they also constantly need tender loving care in the form of chasing down leaks and applying patches. Thus, this list is comprised on quality inflatable kayaks that will, with proper care, last a lifetime. For anglers in search of an inflatable kayak that works as a true fishing boat, it is tough to beat the Sea Eagle 435 Catamaran Inflatable Kayak. Read the article about Catamaran Inflatable Kayaks for more information about these unique boats. The reason these boats excel for fishing is because all the features that anglers usually desire in their boats is either built-in to the boat or is easily attached. And the boat provides superb stability. Tough denier fabric. Boat is made from the same fabric as expedition level inflatable kayaks are. Errant hooks won’t put a hole in it. Capable of handing Class III whitewater without issues, and can do Class IV if you’re a very skilled paddler. Thus, this kayak isn’t just stuck on lakes. Summary – For hard-core anglers in search of an inflatable kayak meant for fishing on lakes or rivers, I can’t think of a better boat than this one. It has all the features most anglers could ever want, and is large enough to pack quite a bit of gear, even for two people, for overnight trips. The ability for two people to “overnight” is one feature that separates this kayak from others on the list. While the Sea Eagle 435 offers the most versatility of any inflatable kayak for fishing, there are several other excellent kayaks available. If you don’t have use for a gas motor on your kayak, and you also want a kayak that is superb for paddling across lakes, then the Sea Eagle 385 FastTrack should be on your research list. This kayak is part of the FastTrack series of kayaks from Sea Eagle. The FastTrack series of inflatable kayaks are designed for quick and simple paddling across large bodies of water (thus these are “lake paddling class” kayaks). These kayaks include a stiff drop stitch floor. The drop stitch floor allows anglers to stand upright in the boat, although the boat isn’t nearly as stable for standing as the wider Sea Eagle 435. Unique among inflatable kayaks, the FastTrack kayaks have an inflatable keel. This keel, combined with the detachable skeg, allows the boat to track very straight. There is virtually no “yaw” when solo anglers paddle this boat. This boat also has a very narrow width, which reduces drag. Finally, the smaller pontoons of the boat reduce surface area contact with the water and also greatly reduces the effect of the wind on the boat’s steering. In short, this kayak is for people who want to paddle across large bodies of flat water, such as lakes. 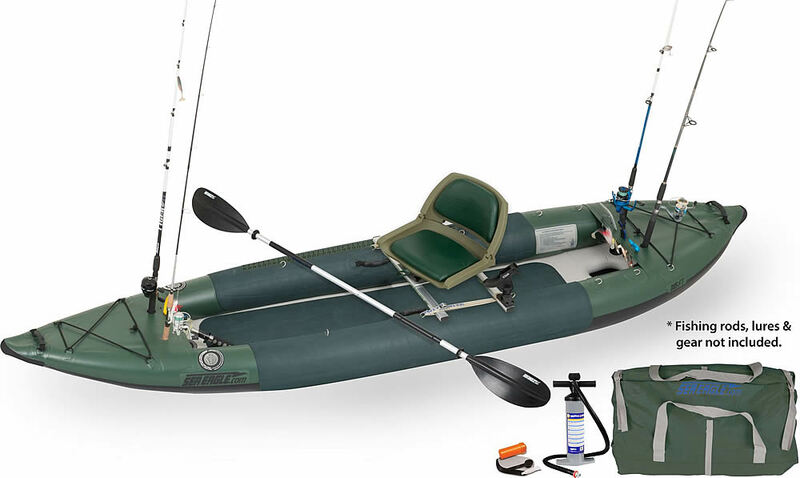 The “fishing edition” of this kayak comes with rod holders, an optional swivel seat with a heightened seating position and a motormount—thus allowing trolling motors to be attached. Gas motors can’t be used. So what are drawbacks to this boat when compared to the Sea Eagle 435? It isn’t as stable. While the FastTracks aren’t “tippy” by any stretch, they also aren’t nearly as stable when compared to the large, double pontoons used on the Sea Eagle 435. The very narrow interior width of the kayak also limits gear storage. Because of the boats smaller pontoons, FastTrack kayaks also aren’t designed for heavy whitewater. They are rated for Class II whitewater, although a talented paddler could weave their way through weaker Class III rapids without many issues. Finally, if this boat is “tricked out” with all the fishing features, it is difficult for more than one angler to fit in the boat. While two anglers can still use the boat when all fishing friendly features are included, it can be a tight and somewhat awkward fit. Summary – If your fishing plans don’t include lots of motoring around and/or you want a kayak that is ideal for lake paddling, then give this boat some consideration. Besides being outfitted for fishing, this boat is an excellent choice for long paddling trips in remote areas. Another option is the NRS Pike Fishing inflatable kayak. If you’ve never heard of NRS before, they manufacturer some of the highest quality whitewater rafts and hard-core whitewater kayaks available. 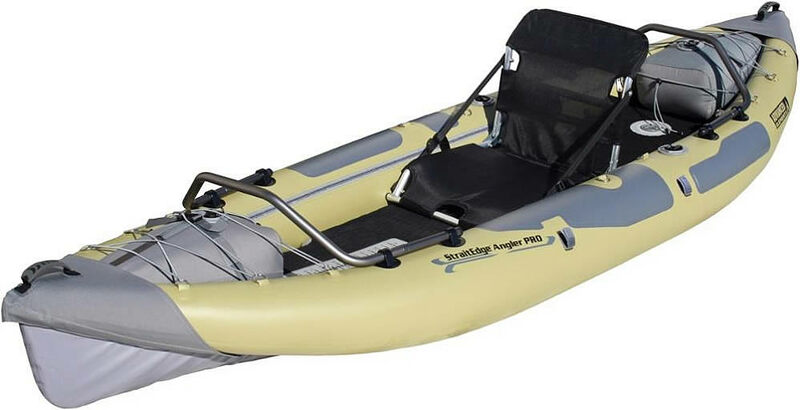 The NRS Pike Fishing inflatable fishing kayak is an expedition level kayak. As such, it is extremely tough and is perfectly capable of running Class III and some weaker Class IV whitewater. While it lacks the keel found on the Sea Eagle FastTrack boat, it does have skegs, which reduces yaw when the boat is paddled. Typical of all boats from NRS, the Pike is very high quality. It’s made from a super thick 2000 denier fabric. Barring some horrific accident, the kayak should last a lifetime with proper care. Due to its rugged design, the kayak also performs well not just on lakes but also rivers. The downside to this kayak is that it has a flat floor. Thus, for real long distance paddling, the boat isn’t an ideal choice. This boat also will prove a tight fit for two people. Once tricked out with all fishing accessories, this boat is best used by one angler. Summary – Falling in the middle tier on a price point scale, this kayak from NRS is super tough and very versatile. Able to handle Class III and weak Class IV rapids, the boat can also take anglers to places other inflatable kayaks can’t reach. This is a great “expedition level” fishing kayak. But for long flat water paddling, this boat isn’t the best choice. Best for one angler or one angler plus dog. The Sea Eagle 350x is part of the Explorer Series of kayaks from Sea Eagle. The Explorer Series is an expedition level kayak. As an expedition level kayak, it is super tough and designed to handle up to Class IV rapids and to take anglers to remote waters. I own the non-fishing version of this kayak, the 380x. What I can tell you is that the boat is bulletproof. It will last forever provided you take care of it properly. And I feel 100% comfortable taking the kayak out on long journeys through remote terrain. Since the 350x is part of the Explorer Series of kayaks, it shares the same hull design and material as the other kayaks, although it is further reinforced in the middle part of the boat (to provide further protection from hooks and other sharp objects). The primary difference between this kayak and other Explorer Sea Eagle kayaks is that the 350x comes standard with rod holders, has a custom front and rear skirt, is meant for one person, and is designed to accept many fishing friendly options. These options available include a high seating platform with a swivel seat and a motormount to allow attachment of trolling motors. Another significant difference between the 350x and my own kayak is that the 350x has a drop stitch floor. The drop stitch floor is stiff and thus allows anglers to stand upright in the kayak, something I can’t do in mine. In many ways, the 350x is similar to the NRS Pike Kayak mentioned above. And the price is about similar as well, too. Summary – The 350x is an excellent inflatable fishing kayak at an affordable price point. About the only limiting factor with this kayak is that it is meant for one. Two people can squeeze into the boat but it would be awkward. Similar to the NRS Pike, this boat is best for one angler or one angler plus one dog. Finally, again similar to the NRS Pike, this kayak isn’t the best for long paddles across lakes. While shorter paddles on lakes is fine, this isn’t the boat to use for paddling trips that require long paddles day after day. While the detachable skeg limits yaw, the boat lacks a keel and isn’t nearly as sleek as other kayaks (in particular, the Sea Eagle FastTrack) specifically designed for lake paddling. A relatively small inflatable fishing kayak, the Straitedge is designed for one angler. One glance at the photo shows how tailored the kayak is towards fishing. Because of its shorter length at 10.5 feet, weight capacity is limited. The kayak’s capacity is only four hundred pounds. While this is fine for day to day fishing uses, the lack of weight capacity reduces the boat’s capability for overnight paddling trips. Advanced Elements Straitedge Angler Pro Fishing Kayak. See more information about this kayak at REI. One of the more unique features of this boat is that it contains a metal frame. Called The Accessory Frame System, the frame provides the ability to mount aftermarket rod holders, fish finders, and numerous other fishing equipment. Similar to other fishing kayaks, the Straitedge contains a drop stitch floor, allowing the angler to stand upright in the kayak. To prevent yawing while paddling, the kayak, as the photo shows, contains two skegs – one in back and one in front. The kayak is made from quality fabric and can withstand Class III whitewater. Due to the kayaks shorter length, anglers who use this kayak on rivers will find the boat highly maneuverable. And like other fishing kayaks, it can be used in coastal waters and larger lakes. Summary – This is a highly customized fishing kayak. Because of it’s aluminum frame, there’s literally endless fishing accessories that can be added to the boat. The main limiting factor is its shorter size, which reduces weight capacity and limits its utility for overnight trips. Finally, despite its shorter length, because of its aluminum frame the kayak is surprisingly heavy. The kayak weighs 45 lbs. At 12 and a half feet in length, the Blackfoot HB is a fishing kayak that can pull double duty as a two person recreational kayak. Like the other fishing kayaks, the Blackfoot HB has a stiff, drop-stitch floor, allowing the angler to stand. Moreover, the boat has drain valves, allowing any water that gets into the boat to drain out. Weighing just 37 pounds, the Blackfoot HB comes with its own backpack, allowing for easy carrying. Moreover, the backpack will come in handy for anglers who use the boat in areas such as the Boundary Waters, where portages between lakes are required. Aquaglide Blackfoot HB Angler. A versatile fishing kayak. See more information at REI.Com. Removable seating platform for higher seating position. Can be used by two people, although it is somewhat of a tight fit. Summary – This is a hard-core inflatable fishing kayak. Every feature on the boat supports fishing. Yet it can also be used for recreational floating with two people. Thus, this kayak has some nice versatility.